After the incredible success of intergalactic blockbuster Avengers: Infinity War and Black Panther, the mighty Marvel Cinematic Universe shows no sign of slowing down any time soon. 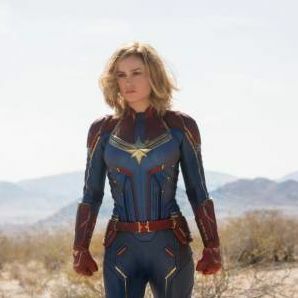 Captain Marvel, somewhat shockingly the first Marvel film with a solo female lead character and the first to be directed by a woman (Anna Boden, co-directing here with regular collaborator Ryan Fleck) is set to introduce the most powerful Marvel character seen onscreen yet, as well as some overdue diversity to one of film's biggest franchises. Brie Larson, who won the Best Actress Oscar for her sensitive, heartbreaking performance in 2015's Room, plays the titular Captain Marvel, an alien who crash-lands in 1990s America and her human alter ego, Carol Danvers, a pilot in the U.S. Airforce. Earth becomes caught in an intergalactic war beyond its control, as the villainous, shape-shifting Skrulls begin infiltrating society by posing as humans and Carol realises that her extra-terrestrial heritage will soon play a part in the fate of her new home. Setting the film in the 90s allows us to be reintroduced to digitally de-aged, younger versions of familiar characters such as Samuel L. Jackson's Nick Fury, (complete with hair and no eyepatch) and Lee Pace's Guardians of the Galaxy villain, Ronan the Accuser, and there are sure to be a few surprises along the way. With a stacked cast of new characters, including Jude Law and Annette Bening in mystery roles as well as Carol's adorable cat Goose, this is set to be another smash hit for Marvel. The outpouring of grief and support when comic book legend Stan Lee passed away last November was testament to the power of his creations, and this latest film from Marvel Studios brings one of his most beloved characters to the big screen at last. We can't wait to join her on this adventure.